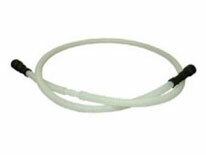 Application – DWDH78 drain hose can be used on most brands of dishwashers. Cutting hose at barb allows the hose to adapt to the newer Whirlpool/Kenmore machines. Purpose – This universal dishwasher drain hose can be used to connect many brands of dishwashers to the drain. In addition, the DWDH78 is designed to be used as an extension to existing drain hoses when cut at the designated place. Location – The dishwasher drain hose usually connects to the drain pump on the dishwasher and to disposal on the sink. Specifications – 1/2″ ID x 78″ length; Dishwasher pump end fits 1-1/8″ ID, 7/8″ ID, or 1/2″ ID; Sink end fits 1″ ID, 3/4″ ID, or 5/8″ ID. Cut hose at barb to use as extension. Bring your old drain hose in to the U-FIX-IT store to determine if this universal hose/extension is a good fit for your dishwasher.